My server at Casa Brasil in Highland Park laughed as he said this, setting down a plate of chicken on the table. But he was right — the restaurant’s homestyle, down-to-earth dishes, with their authentic, intoxicating flavors, struck a heavenly chord. Part-owner Keyla Nogueira Cook became a force in Pittsburgh’s food scene, working freelance and catering across the city. 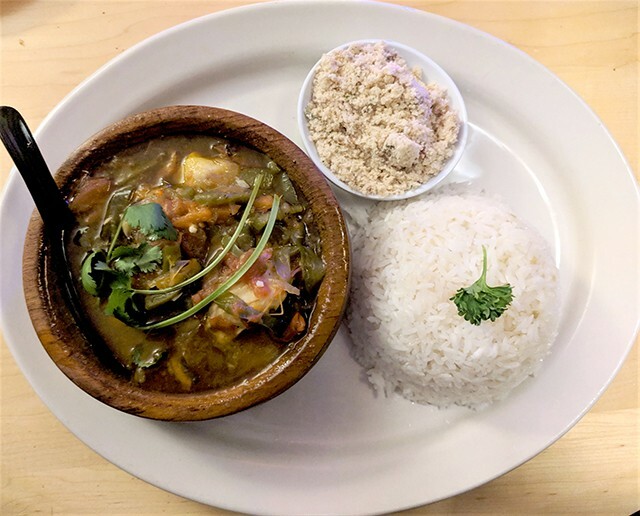 In 2018, Cook and partner Tim Guthrie decided to join the ranks of Pittsburgh pop-ups by renting the Bryant St. building previously occupied by Plate & Bowl, bringing a fresh take on Brazilian food to Highland Park. At Casa Brasil, no towering skewers of meat float around the restaurant. Cook’s menu lists traditional, at-home eats, like stews and prato feito (a plate composed of rice, beans, meat, and vegetables). On Saturdays and Sundays, Cook prepares Brazil’s national dish, feijoada (black bean stew). From the outside, Casa Brasil looks like a house. A double-window bigger than the restaurant's front door sheds light on a fenced-in patio area. Inside, the intimate dining room alludes to warmer weather with bright colors and energetic rhythms. Bookcases display knick-knacks and cookbooks. It’s simple and cozy, with a heartbeat of tradition. I visited Casa Brasil on a cold night, taking refuge at a tucked away table. After glowing recommendations from my server, I ordered three dishes: pão de queijo (cheese bread rolls), frango à passarinho com molho de iogurte e limão (fried chicken with a yogurt and lime sauce), and moqueca de peixe (codfish stew). I started off with the cheese bread: five rolls tumbling on a plate, splotched with evidence of fresh toasting. I broke the crunchy crust and was rewarded with a mouthwatering cheese pull. It was dense, heavy in my hand, and an obvious success. There are few things better than bread and cheese. Next to the rolls, four massive pieces of chicken, all steaming with an intoxicating aroma, dressed up a white plate. Cook marinated the chicken for at least two days, resulting in juicy, flavor-smacking meat. 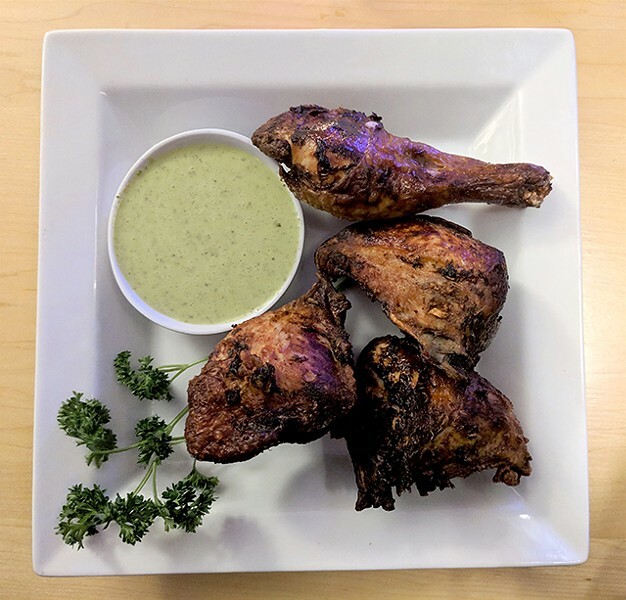 The lime, yogurt, and cilantro sauce punched each bite with citrus, breaking through the crunchy, spice-heavy ends of the chicken. The dish had me dancing in my chair. My stew was straightforward comfort, a warm embrace of nostalgia-inducing taste. The codfish flaked apart, light enough to balance out the robust coconut milk-based soup filled with vegetables and rice. It finished off with a dusting of farofa (toasted yucca flour with herbs), boosting the stew with salt. The flavors delivered a familiar homesickness, one that only follows true comfort food. 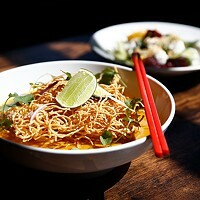 For now, Cook and Guthrie plan to inhabit the Bryant St. space until their lease is up in a year. But based on Cook’s flavor-driven, all-around delicious dishes, Casa Brasil deserves a permanent home. In my ranking of hot drinks, mint tea takes a top slot. Casa Brasil makes its with fresh mint, a delicacy I’m head-over-heels in love with. It’s miles better than a teabag. Casa Brasil introduced me to farofa. It has the texture of finely ground pretzels but is herbal, salty, and surprisingly delicious. 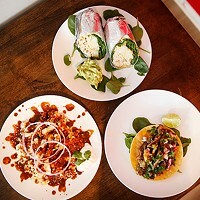 On Mondays and Tuesdays, when Casa Brasil is closed, Cook offers the space to other local pop-up kitchens. Past dinners feature authentic Chinese and Puerto Rican food. Keep an eye on the website for more Resedencía announcements to come.